What we generally refer to as morality is the conscious attempt to benefit society. By, constrast, immorality is toinfringe upon others and to undermine social order. Buddhism is a religion that places humanity at the centre of everything, and Buddhist moral standards are reason, law, and guidance. For example, “Entering the court, one assists the king with determination and loyalty; at home one assists one’s parents with respect, sincerity, filialness, and loyalty”. It goes on to assert. “If one yearns and strives for good, onewill be able to settle down; if one yearns for and strives to be filial and respectful,one will glorify one’s parents. the other two being Sanskrit and Prakrit. Lord Buddha taught in Pāḷi language which is also known as Māgadhi. and some parts of Madhya Pradesh. Buddha delivered His messagein Pāḷi, the language which both the elite and the ordinary people could master, so that the spirit of His Dhamma could enrich the minds of all. In this way Pāḷi played a historical rolein a practical manner through centuries and, indeed, it does even today in all the Buddhist countries. bias, the rightful place of Pāḷi has not been restored. was prepared in 1954, when I taught at the Pali Post-Graduate Institute at Nalanda. Thereafter it was used to instruct the students undergoing course in Pāḷi studies and Buddhology in Bangalore. sacred texts. It is called Pāḷi. grasp of common people, accessible only to the elite class. This is one reason, why Pāḷi is subjected to step-motherly treatment by sanskritists. interest of Sanskrit, at least classical Sanskrit, which is widely studied today. Pāḷi should be propagated as a sister discipline. This apart, chronologically, Pāḷi is decidedly older than modern classical Sanskrit. two prominent pronunciations which depends on the community). short or long, according to the context. are treated as nons because they areSimilarly declined. 1. Pullingga = Masculine gender. 2. Bahuvacana = plural numbers. 8. Alapana vibhatti = Vocative case = Oh, etc. are declined according th the genders,Numbers and cases. example: Buddha = The awakened One. women and the others in the state. the police officers will have to face the punishment, she said. a far cry for the SCs and STs. report” to the DGP and the state government as well. and ST will apply here also. private firms for their maintenance and management. Samajik Parivartan Prateek Sthal and Samta Mulak Chowk. civil engineer and an electrical engineer. the premises and day-to-day maintenance of other utility areas. The firm will have to prepare a separate plan for visits by VIPs. Baudha Vihar Shanti Upwan in Alambagh. The Uttar Pradesh government on Saturday claimed that construction in the controversial park at Noida has followed all norms. the Chief Forest Conservator (Wildlife) in this regard. This initiative need to be appreciated. Police and Bureaucracy need to be liberated from the hands of castism and religious fundamentalism. UP Special armed force is notorious for its communal colour. Hope the new recruitment under BSP govt. will bring radical changes to the police. You can decontaminate a Nuclear plant but you can’t decontaminate a sick hindu mind. please ask them to contact the NGO-Prerana (supported by Infosys foundation). eligible for financial help for their further studies. Even if you dont know anyone, please pass on this info, some one might be in need of this help desperately. India’s Supreme Court has declined to stop the building of statues of the politician Mayawati and her allies. Ms Mayawati, a low-caste Dalit - formerly “untouchable” - is an icon for India’s 160m low-caste Hindus. She is accused of self-glorification by her critics. But she accuses her opponents of conspiring against her. Legal experts say that Friday’s decision is a major relief for Ms Mayawati’s plans to continue major building works. She is building several statues of herself, her political mentors and elephants- the symbol of her party. courts can do,” Chief Justice KG Balakrishnan said. for installation of the statues. Uttar Pradesh is one of India’s most deprived states, with a high crime rate and poor health services. 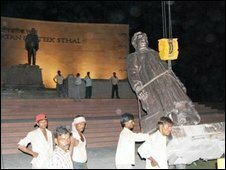 Ms Mayawati’s spending on statues and memorials has been described as “shameful” by India’s Home Minister P Chidambaram. In May she unveiled 15 new memorials, including two of herself. Statues of political leaders are generally put up posthumously, but Ms Mayawati says that belief is outdated. moving and a new history is in making. Brahmin’s envy is dalits pride so go for a ride. A dream never come true. And she wrote OUR history. So now, WE can afford to be ‘invisible’. OUR history in stone stands tall. And WE don’t need YOUR Shakespeare, Tagore and Gandhi..
1. Annihilation of Caste and Tribal Oppression. 2. Becoming the ruling community by establishing Social Democracy in the country. 3. Organising Enlightened India through Sane and Egalitarian leadership. We found 216 of your friends on hi5! The following contacts are already members of hi5! Select or deselect your friends from the list of hi5 members below and click Add Friends. By clicking Add Friends, friend requests will be sent to all selected friends.